Ambulance Communications Officers in our region receive more than 36,000 medical and fire calls a year for assistance. On-duty 24/7, 365 days a year, this work is critical to the chain of survival—but the staff performing this vital function are rarely visible. The North Bay Central Ambulance Communications Centre (CACC) is joining Emergency Communications Centres throughout the Canada in celebrating the second full week of April (April 15-21, 2019) as National Public Safety Communicators Week. This week honours the thousands of men and women who answer emergency calls, dispatch emergency professionals and equipment and render life-saving assistance to citizens. In her 15 years of dispatching at the CACC, Christine Corbeil has experienced a wide variety of emergencies and tragedies. Corbeil’s fondest memory is providing emergency child birth instructions over the phone to a father. While emergency responders raced to the scene, Corbeil assisted the father in delivering the family’s first child and the emergency responders arrived to find a beautiful baby girl. “Hearing the father say thank you for helping deliver his beautiful baby girl was a great moment,” Corbeil remembers. She still proudly wears a pink stork pin, a gift to her from her manager following the call. Often referred to as the first, first responders, communicators have a challenging task. It is imperative that the call taker determine what happened and how to help before responders arrive. “Remain calm, stay on the phone and help us help you,” says Jennifer Durham-Gagne, a 14 year veteran of dispatching at the CACC. Call information is sent electronically to the dispatcher for action well before the telephone call is terminated. And even though cell phone technology has improved significantly over the years, it is still important to know where you are. “Our area spans from Kirkland Lake to Sundridge, so providing your location as Highway 11 isn’t very specific for us,” Durham-Gagne says. Marc Picard, Manager, CACC says while an emergency call takes only a few minutes, in a crisis it can feel much longer and the call taker must remain calm when most callers are anxious, distraught or confused. educate your guests on the location/address/co-ordinates of your cottage and some local points of interest, such as lakes or islands. 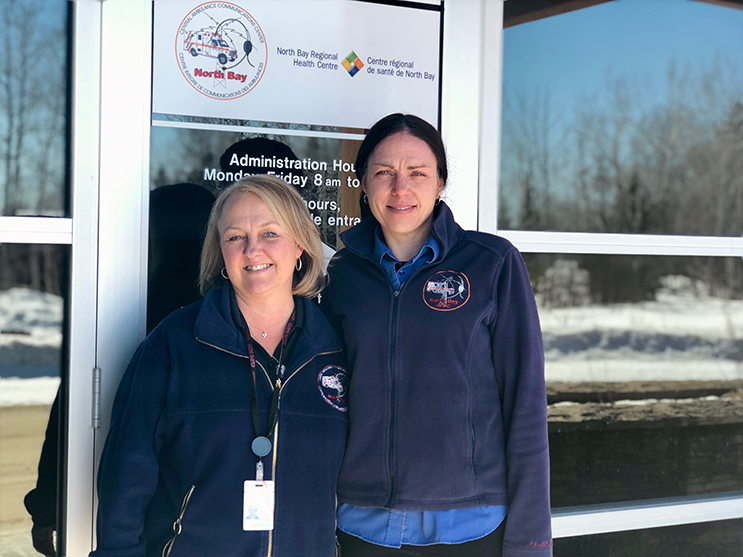 Ambulance Communications Officers Christine Corbeil and Jennifer Durham-Gagne at the North Bay CACC. 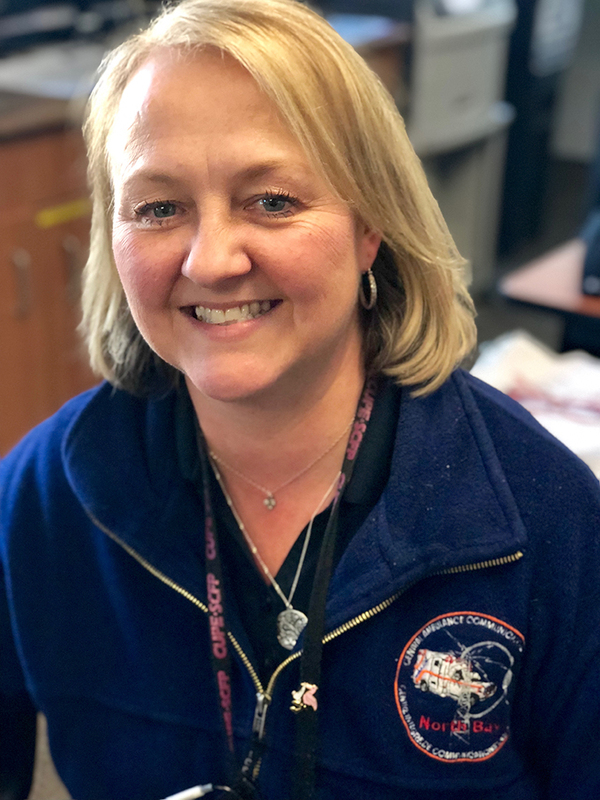 Ambulance Communications Officer Christine Corbeil poses with her pink stork pin visible on her lanyard. Ambulance Communications Office Jennifer Durham-Gagne at her work station. 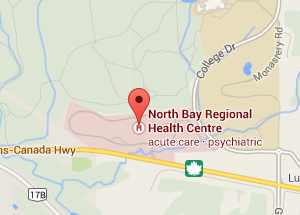 The North Bay CACC is a department of the North Bay Regional Health Centre located off-site. Under the direction of the CACC Manager, the North Bay CACC is staffed daily by Team Leaders, full time and part time Ambulance Communications Officers and support staff, including an Operations Supervisor, Information Support Officer, Liaison & Policy Officer, as well as an administration clerk. On duty CACC staff manage 23 EMS Resources at 10 EMS stations, 9 First Response Teams and 20 Volunteer Fire Departments. This includes Primary Care and Advanced Care Paramedics, Supervisor units and any air ambulances resources that are in the area. 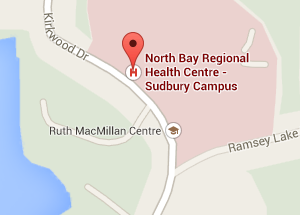 The CACC also coordinates the use of the NBRHC Community Transfer Vehicle. Behind the dispatchers are an administrative staff that support and assist their work, from payroll, to policy writing, to computer maintenance and upgrades. There are 58 Fire Departments in the geographical area covered by the North Bay CACC. Most Fire Departments maintain a tiered response agreement with EMS, which dictates when the CACC should notify them to respond to assist with medical calls, off road rescues or motor vehicle collisions. CACC coordinates the movement of patients to and from the North Bay Regional Health Centre, West Nipissing General Hospital, Mattawa General Hospital, Temiskaming District Hospital, Englehart and District Hospital as well as the Kirkland Lake and District Hospital within the catchment area as well as the bordering hospitals of Health Sciences North, Timmins and District Hospital, Huntsville Hospital and Centre de Santé Timiskaming to name a few. With the assistance of the Ornge Communications Centre, emergency calls and non-emergency long distance patient transfers are coordinated with both helicopter and fixed wing air ambulance resources. 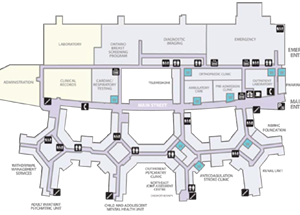 There are five hospital helipads, 14 community helipads and three airports within our catchment area. During daylight hours, an air ambulance helicopter can choose to land directly at the scene of a serious incident if there is a sufficient clearing. The CACC has a Quality Assurance program which ensures that calls are constantly reviewed to maintain a high quality of service mandated by the Ministry of Health and Long Term Care. 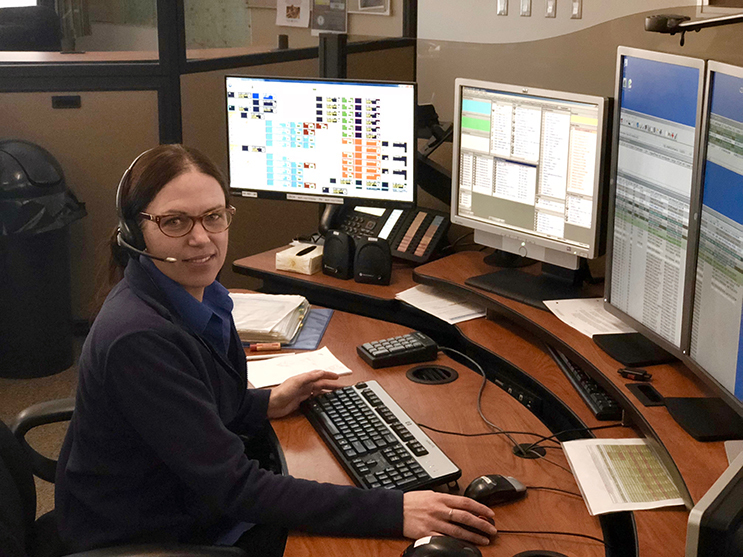 The North Bay Central Ambulance Communications Centre is committed to ensuring a high level of communications services are provided to both the citizens of Ontario, the ambulance services, fire department and police services at all times.